It’s hard to believe how fast summer is flying by! We hope you are experiencing a fulfilling summer and that you’re refreshed and ready to head back to school once summer draws to a close. We agree that summer is ending too fast, but we have some exciting news for you that will make your end-of-summer-blues disappear! While you have been enjoying your much deserved time off, our team of gifted curriculum creators have been working tirelessly these past months to re-design some of our lessons. The most important changes will be in the areas of Response to Text/Literature. The skill lessons we are enhancing are being emphasized in the CCSS as well as the PARCC and Smarter Balanced tests. Our revisions are not being made simply because of the new tests, nor are we “teaching the tests.” We are responding to a need that has been voiced to us by YOU. A big push is being made to prepare students for college and career readiness. Being able to write in response to texts is needed for this goal. Improved Table of Contents, making resources easier to find. There is a new Conversion Chart in Pre-unit 1. You will no longer need to do the math when converting a raw score to a letter grade. Additional grammar skills have been added so grammar standards are covered in lessons. Improved rubrics state specific Common Core standards on each rubric to assist you at report card time. More opportunity for timed writing; writing in one session (This will help prepare students for the type of writing being asked for on assessments like Smarter Balanced and PARCC). Increased time for writing in the classroom. The month references on the Pacing Guides were changed to number of weeks, so it is easier to schedule your year with WriteSteps, regardless of your school calendar. Expanded lessons in grades K-2 with a focus on sentence construction. Greater emphasis on speaking and listening standards. Lessons that teach narrative paragraphing. A “student sample bank” which will provide a wider variety of student samples. Pre-unit 1 has a new technology list that offers suggestions of great digital tools your students can use to publish their work. Additional demonstration videos, Power Point, and Prezi lessons (for the first lesson of every unit) for teacher use. New and improved narrative planning sheets. Additional guidance on editing and revision (stronger focus in 4th and 5th grades). We hope you make the most of the rest of your summer. Scroll down The Inspired Writer to download a back to school freebie! If you already have WriteSteps, the best way to download revision 4 is to log in to your eWriteSteps account and download the new update. Once we have the final touches on revision 4 you will see a button (see image below) letting you know revision 4 is ready to download. In the meantime, it is important that you learn how to navigate eWriteSteps prior to downloading any of the new changes. If you haven’t had the time to learn, or are unsure how to access your account, you can watch this 8 minute tutorial on how to use eWriteSteps. eWriteSteps contains the entire daily lesson plans included in your print binders, streaming videos of modeled WriteSteps lessons, video updates, and updates for the printed binders. This is why it is important for you to set up an eWriteSteps account and use it regularly. Why do we improve and update WriteSteps? We do it to meet the needs of our teachers. In professional development and in our support phone calls, teachers will say, “I rearranged the graphic organizer because my students needed more steps,” or “My school focuses on research mid-year, so I need…” If it will help make teaching writing easier for our teachers, we listen and look for ways to help. We do it to meet the needs of our schools. For example, we learned a school was going to convert to CCSS report cards so we added core code numbers to the pacing guides and rubrics. As units were taught and scores given, these core code numbers helped teachers translate them directly to the report cards. We do it to meet the needs of our districts. Districts that are required to teach the CCSS will be choosing the tests that will reflect the requirements of the Core Standards. The Core Standards stress preparing students for college and career readiness. This means there needs to be a heavy emphasis on close reading, analytical thinking, and writing in all core subjects. Because we want to provide the best materials teachers and students need, and because we want to stay current with educational trends, we make changes and updates to WriteSteps. This sets us apart from other writing programs out there. We listen to what our teachers, schools, and districts have to say, and consider their voices and ideas. “Don’t you love New York in the fall? It makes me want to buy school supplies.” This quote, from the movie You’ve Got Mail, always makes me reminisce about my childhood and the memories of that first week of school after a fleeting summer. I remember the feeling of the butterflies taking flight in my stomach, never knowing exactly what to expect, stepping into my new classroom for the first time. My school supply shopping was complete, I had the perfect outfit planned, but would my teacher be nice? Would my friends be in the same class? Who would I sit next to? What would the coming year be like? Little did I know that these first days of class would introduce me to lifelong friendships, would teach me about changes, and would also lead me to that special teacher that helped shape who I was, long after I left her classroom behind. Are you ready to head back to school? It’s time to prepare for new classes, visit with colleagues, plan your lessons, and stock up on new classroom supplies. 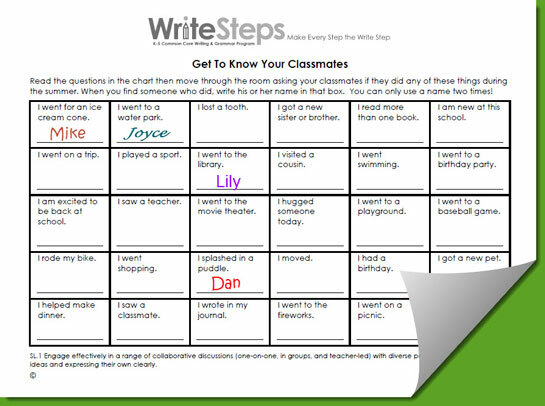 This activity is perfect for your class to complete. It helps break the ice, eases those nervous butterflies, and sets a welcoming tone for your students the first week back. SL.1 Engage effectively in a range of collaborative discussions (one-on-one, in groups, and teacher-led) with diverse partners, building on others’ ideas and expressing their own clearly. As summer ends and children start returning to school, I realize I took those back-to-school moments for granted. If I had the chance to visit my younger self and be that little girl beginning her first week of school again, I would. To me, the last weeks of August leading into fall are synonymous with returning to school. And during this special time of year, to finish the quote in You’ve Got Mail, it makes me want to buy a bouquet of sharpened pencils. As a former educator with over 25 years of experience in educational publishing, Marilyn Massey brings vast experience and knowledge of the education market to our team as a new Awareness Ambassador (Independent rep) for Georgia. Her skills include program development, professional development and training, and sales. Her prior experience includes a position as vice president of sales and marketing, author of several tutoring programs, and has presented at national, state, and regional conferences. As a program author, her writing skills were honed and a greater understanding of the publishing process was developed. 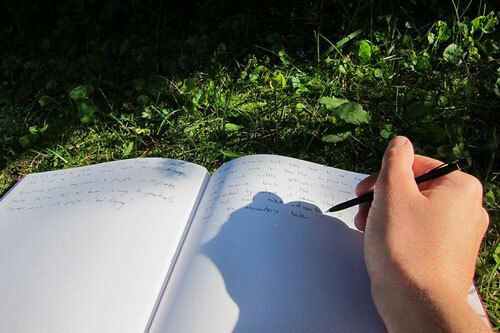 “The WriteSteps program is fantastic,” says Marilyn. “It is a pleasure to share it with my customers.” Outside of work, Marilyn is an avid reader, loves design, and participates in many volunteer activities. Welcome to WriteSteps Marilyn! Copyright © 2013 WritingCity, All rights reserved.